Next on The Scoop: Celebrate National Adopt a Shelter Pet Day With These Celebripets! What are some angry cat sounds and what do they mean in cat language? How should we as cat parents react to these angry cat sounds? The other day I was making breakfast when I heard a familiar sound coming from the living room — a low-pitched grumble, not unlike the sound a monster makes in a horror movie. The sound quickly escalated to a yowl, followed by claws scraping along the wood floor. I had not, in fact, accidentally raised an ancient ghoul — it was just my young cat, Salvypoo, “playing” with my cranky old calico, Phoenix, who was utilizing some angry cat sounds to express her displeasure with her hyperactive sibling. 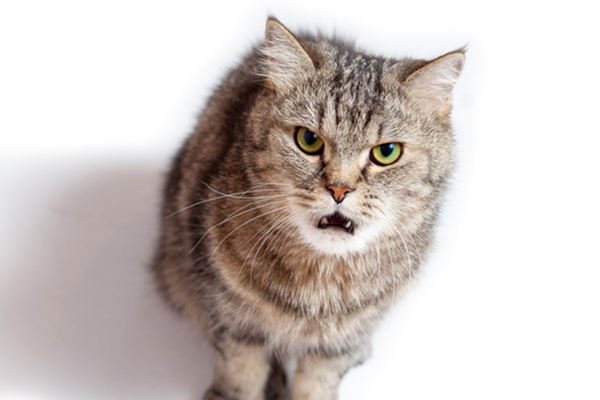 While not as pleasant as a gentle purr or an inquisitive meow, angry cat sounds are an unmistakable and important way your kitty communicates. 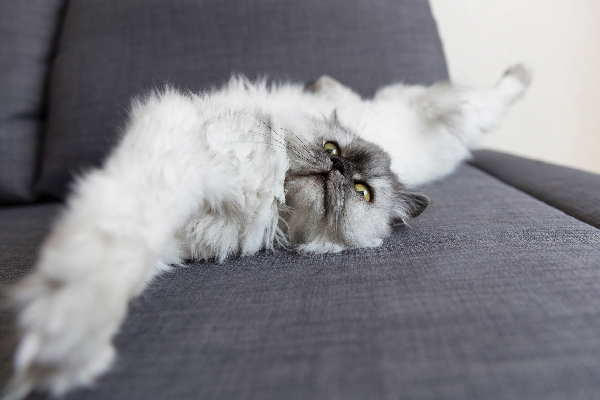 Recognizing when your cat is angry and being aware of why it happens will help you know when she needs time to decompress — and may prevent you from an accidental scratch or cat bite injury. Growling is often the first audible clue that your cat is angry. When Phoenix gets mad, she first communicates with body language — ears down, eyes wide, tail flailing from side to side. Then comes the growl, starting as a low-pitched grumble like angry Marge Simpson and quickly building to a yowl if whatever is ticking her off does not back the heck off. 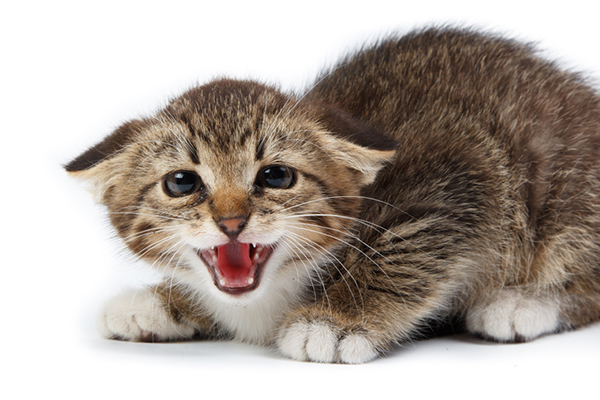 For many cats, growling is just that — a warning noise that likely stems from annoyance, anger, aggression or fear. If your cat is growling, it’s probably wise to take a breather before attempting to pet her or pick her up to calm her down. Angry meows are another angry cat sound. Photography ©points | Thinkstock. Growling can often be accompanied by an angry meow, which sounds like a regular meow filled with gravel and steroids. The angry meow can also be used as a kind of exclamation point, punctuating the growl as if to say, “And I mean it.” When the meow becomes high-pitched and multisyllabic, that indicates the cat is especially stressed. Cats can hiss for lots of reasons, but if your cat is hissing because she’s angry, it’s pretty much the equivalent of you spewing a stream of curse words at the jerk who just cut you off in rush-hour traffic — that is, your kitty is making this sound because she’s darn mad, or more likely some combination of confused, frustrated and afraid. Hissing is a cat’s instinctual response to something he perceives as a threat, which could be as intimidating as a shot-wielding veterinarian or as mundane as another pet scooting too close to him on the couch. In any case, hissing is among the angry cat sounds that warn. Basically, it’s the feline equivalent of a middle finger, meaning this angry cat is ready to fight. When Phoenix hisses, a swipe of her paw with claws extended is soon to follow. Don’t approach a hissing cat. Instead, it’s best to give him some space until he calms down and feels safe again. Sounds aren’t the only tip-off that your cat is angry. Photography ©Ornitolog82 | Thinkstock. In addition to angry cat sounds like hisses, growls and angry meows, you can tell your cat is angry by paying attention to her body language. I’ll use Phoenix as an example. 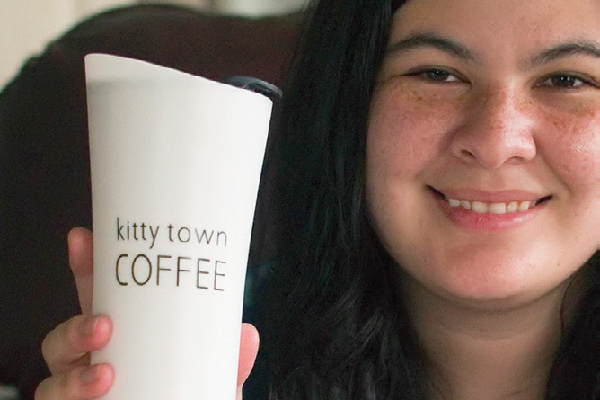 When she’s calm, she’s the sweetest kitty on the planet — very gentle, inquisitive and affectionate. I have a nine-month-old son, and she will let him pet and squeeze her without any hint of annoyance. During these interactions, her ears are upright, her eyes are squinted in a “smile,” and her tail is either raised or flicking casually from side to side. If she vocalizes, it’s likely to be an insistent meow begging for more chin scritchies. When Salvypoo playfully attacks her, though, Phoenix’s body language completely changes. Her ears flatten against her head, her pupils dilate, her shoulders hunch and her tail twitches violently – or puffs up if she’s especially angry or afraid. She also reacts this way to the vacuum cleaner. 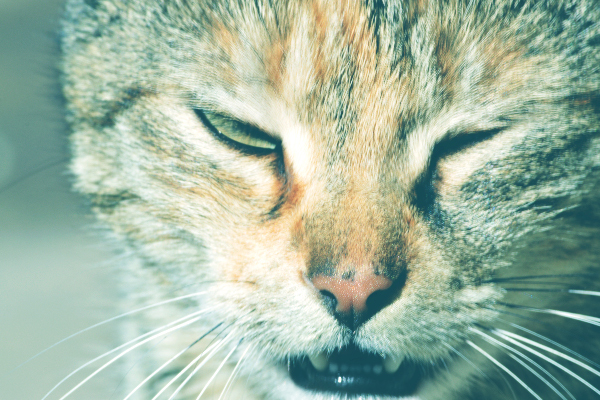 How should you respond to angry cat sounds? 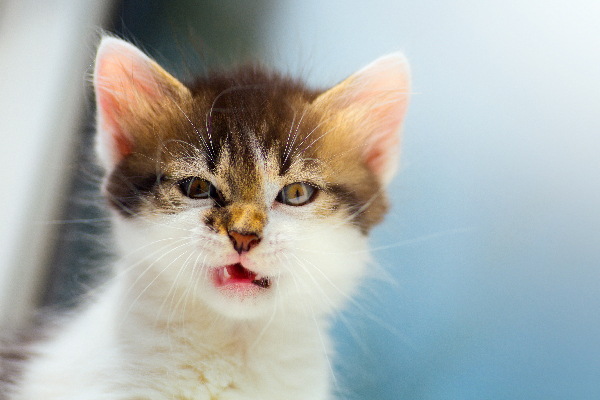 How should you respond to angry cat sounds? Photography ©prospective56 | iStock / Getty Images Plus. When dealing with an angry cat, it’s always better to be safe than sorry. 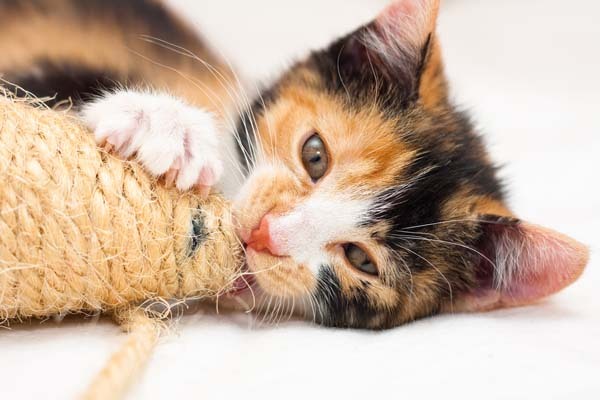 When threatened, cats are running on adrenaline and instinct, which means anyone — even a safe, familiar cat parent — is likely to get injured if they approach. Your best move is simply to walk away. If possible, leave the room — or allow the cat to leave the room and retreat somewhere quiet, away from whatever she perceives to be the threat. Never punish a cat for being angry. Instead, give your kitty some time to cool down, and instead of approaching your cat, wait for her to come to you. Before you know it, she’ll be curled up purring in your lap again, making much friendlier sounds. Thumbnail: Photography ©Konstanttin | iStock / Getty Images Plus. Our male part Mainecoon cat 14 lb.cat has gone from a loving sweet entertaining boy to an angry hissing growling meany to our new 1 year old little Calico girl.He has some kind of panic episodes and is on medication for anxiety,He poops on the floor and runs through the house in panic.We have increased his meds. He smacks us,if we talk to him when he is in one of his episodes.Our vet has no answers for us and I am seriously thinking he might have to be put down.He is never happy and always sullen. Maisie won’t even enter a room he is in. I’m in tears often to think our beautiful boy has gone this way.Any help would be most appreciated. These articles might provide some good insight. My cat can be a lovable sweetheart, to me anyways. Well I have 2 dogs, 1 female Norfolk terrier 6yrs old, 1 male chiweeny 5yrs old. Sweet dogs. The chiweeny, I acquired him by which he was abandon in my old neighborhood. Someone just left him there in front of a house around the corner from my house. I took him in so he wouldn’t get hit by a car. We’ve had him for over a year now. He’s a licker boy. He can’t stop. Back to the beginning, my cat whom was also abandoned to at 2 weeks old. He’s now going to be 1 yrs old and He’s a big kitty. He seems to not like my chiweeny. At other times I find him giving my dog a bath. Or curled up with him in the dogs bed. Most of the time my cat keeps hunting my dog. But it looks like he’s about to seduce the dog. He slowly creeps up behind the dog, wraps his arm around him then swoops in for the bite. Like a vampire goes in for the kill. I don’t understand this relationship. I’m confused. Interesting … is there any particular time of day / pattern to when he has these noisy fits? If he stops when you enter the room, he may just be doing it for attention! Never allow a younger stronger and especially male cat terrorize an older cat, especially a female. 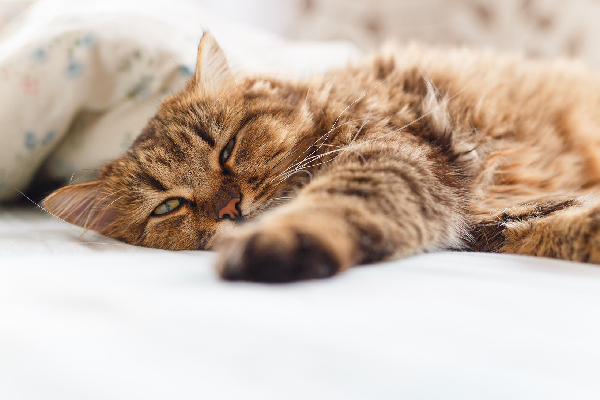 It’s cruel and can actually cause the older cat to get bladder stones. It happened to my cat. Expensive surgery. She nearly died. She was bleeding out her bottom and her white fur was covered with blood. It was emergency surgery after going to different vets including the emergency vet for 18 months. She would scream in agony. Terrible. It’s the stress and fear of going to the litter box and holding urine and fear of going to the water bowl. Put water everywhere. The picked on cat will be fearful of moving much because that brings the attention of the dominant cat bully. In that first video that grey cat was not playing. He wanted to hurt her. Separate them at night so the weaker, older cat can get some peace and quiet at least some of the time. Separate them when you are not home to watch them. Not fair to the weaker cat. I learned that the hard way. I have 5 cats. 4 female and 1 male. Everyone gets along basically except for one female who is constantly trying to pick a fight with our male cat. I have no idea why, but you can see he tries to sneak past her when he can. I am constantly shooing her away from him. But then there are days when she’ll just walk past him like he’s not there. Totally weird. It’s funny, out of the four cats I have currently, one has never hissed or shown aggression. (Other than bopping her littermate in play, not true aggression.) Her sister has picked up grumbling from the older female (who I call half-feral in fun). The boy is a bit older, so he can be grumpy if annoyed. It’s just so funny to me how Belle, the first I mentioned, is so docile she doesn’t seem to know how to be angry. I’m sure if she is ever frightened, that side might come out, but it hasn’t happened yet.